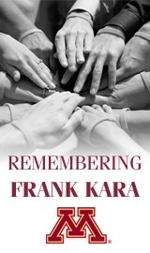 Another award in Frank’s honor but at the national level is the Frank Kara Leadership Award. The National Association for Athletics Compliance (NAAC) created this award to recognize athletics compliance officers who demonstrate outstanding leadership in their field. Recipients display exceptional leadership and unique vision for compliance initiatives, as well as demonstrating a commitment to furthering the compliance profession through being instrumental in the revitalization of NAAC. The Frank Kara Leadership Award is NAAC’s most prestigious annual award. The National Association for Athletics Compliance (NAAC) has announced that Bob Minnix has been named the recipient of the 2016 Frank Kara Leadership Award. Minnix, a NAAC Past President, joined Washington State in 2008 and is charged with oversight of many programs, including the Student –Athlete Transition and Retention Department, the Leadership Program, the Mentoring Program, the Life Skill Program and the SAAC group. Sport responsibilities include serving as the liaison to the football program and oversight of baseball, men’s golf and women’s golf. While at Florida State, Minnix oversaw all departmental compliance issues, implemented and directed Florida State's rules education programs and served as the department's liaison and contact with the University's General Council as well as other legal interests. He was directly involved with the strategic planning of long range departmental goals regarding student-athlete welfare and life skills training. Minnix also worked at the NCAA and is the former president of the Black Coaches Association, has chaired the NCAA Committee on Sportsmanship and Ethical Conduct and is a former member the NCAA Academic Eligibility Compliance Cabinet.